The W3C Web of Things (WoT) was created to enable interoperability across IoT Platforms and application domains. WoT provides mechanisms to formally describe IoT interfaces to allow IoT devices and services to communicate with each other, independent of their underlying implementation, and across multiple networking protocols. In addition WoT offers a standardized way to define and program IoT behavior. This WoT Architecture document describes the abstract architecture for the W3C Web of Things. It is derived from a set of requirements that were derived from use cases for multiple application domains. The architecture can be mapped onto a variety of concrete deployment scenarios, several examples of which are given. the Web of Things (WoT) Scripting API [[wot-scripting-api]]. The WoT Thing Description is the primary building block, as it describes the network-facing interface of a Thing (WoT Interface). The optional WoT Binding Templates can be used to describe multiple protocol bindings, so that a Thing can communicate with different IoT Platforms (i.e., IoT ecosystems or standards). the Web of Things (WoT) Security Testing Plan [[WOT-SECURITY-TESTING-PLAN]]. Overall, the goal is to preserve and support existing IoT standards and solutions. In general, W3C WoT is designed to describe what exists rather than to prescribe what to implement. and security considerations to be aware of when implementing WoT building blocks in chapter . This document uses the following terms as defined here. The WoT prefix is used to avoid ambiguity for terms that are defined specifically for Web of Things concepts. A running or periodically running process that consumes one or more Things (read and processes there data, control their state) and/or exposes one or more Things (provide access to locally gathered data or computed from consumed Things, provide remote control and management interfaces). The application can be implemented using the WoT Scripting API or native platform APIs. The application may also be distributed over multiple Things and other hosts. A re-usable collection of blueprints for the communication with different IoT platforms. The blueprints includes the required vocabulary for the WoT Thing Description to map Interactions to platform-specific messages as well as implementation notes for the required protocol stacks or dedicated communication drivers. To process a WoT Thing Description and from it create a Consumed Thing software abstraction as interface for the application in the local runtime environment. A software abstraction that represents a remote Thing used by the local application. The abstraction might be created by a native WoT Runtime, or instantiated as an object through the WoT Scripting API. An entity that can process the WoT Thing Description format and interact with Things (i.e., consume Things). A digital twin is a virtual representation of a device or a group of devices that resides on a cloud server, edge device, or proxy. It can be used to represent real-world devices which may not be continuously online, or to run simulations of new applications and services, before they get deployed to the real devices. Linked Data vocabulary that can be used in the WoT Thing Description, but is not defined by W3C WoT. a device which provides an entry point into enterprise or service provider core networks. Examples include gateways, routers, switches, multiplexers, and a variety of other access devices. An Interaction Affordance that describes an event source, which asynchronously pushes event data to Consumers (e.g., overheating alerts). A sandbox within the WoT Runtime that isolates scripts running on the same Servient. To create an Exposed Thing software abstraction in the local runtime environment to manage the state of a Thing and interface with the behavior implementation. A software abstraction that represents a locally hosted Thing that can be accessed over the network by remote Consumers. The abstraction might be created by a native WoT Runtime, or instantiated as an object through the WoT Scripting API. A serialization of a Protocol Binding in hypermedia, that is, either a Web link [[!RFC8288]] for navigation or a Web form for performing other operations. Forms can be seen as request templates provided by the Thing to be completeted and sent by the Consumer. Metadata of a Thing that shows and describes the possible choices to Consumers, thereby suggesting how Consumers may interact with the Thing. There are many types of potential affordances, but W3C WoT defines three types of Interaction Affordances: Properties, Actions, and Events. A fourth Interaction Affordance is navigation, which is already available on the Web through linking. An intermediate abstraction that formalizes and narrows the mapping from application intent to concrete protocol operations. In W3C WoT, the defined set of Interaction Affordances constitutes the Interaction Model. An entity between Consumers and Things that can proxy, augment, or compose things and republish a WoT Thing Description that points to the WoT Interface on the Intermediary instead of the original Thing. For Consumers, an Intermediary may be indistinguishable from a Thing, following the Layered System constraint of REST. A specific IoT ecosystem such as OCF, oneM2M, or Mozilla Project Things with its own specifications for application-facing APIs, data model, and protocols or protocol configurations. The mapping from an Interaction Affordance to concrete messages of a specific protocol, thereby informing Consumers how to activate the Interaction Affordance. W3C WoT serializes Protocol Bindings as hypermedia controls. A runtime system that is used for implementing an API in a scripting language (e.g., using ECMAScript, LUA, Python, etc.). A software stack that implements the WoT building blocks. A Servient can host and expose Things and/or host Consumers that consume Things. Servients can support multiple Protocol Bindings to enable interaction with different IoT platforms. An extension mechanism to a transfer protocol that must be known to interact successfully. An example is long polling for HTTP. Short for WoT Thing Description. A controlled Linked Data vocabulary by W3C WoT to tag the metadata of Things in the WoT Thing Description including communication metadata of WoT Binding Templates. A directory service for TDs that provides a Web interface to register TDs (similar to [[?CoRE-RD]]) and look them up (e.g., using SPARQL queries or the CoRE RD lookup interface [[?CoRE-RD]]). The underlying, standardized application layer protocol without application-specific requirements or constraints on options or subprotocol mechanisms. Examples are HTTP, CoAP, or MQTT. An instance of a Thing that represents a Thing that is located on another system component. The network-facing interface of a Thing that is described by a WoT Thing Description. A runtime system that maintains an execution environment for applications, and is able to expose and/or consume Things, to process WoT Thing Descriptions, to maintain private security metadata, and to interface with Protocol Binding implementations. A WoT Runtime may have a custom API or use the optional WoT Scripting API. The application-facing programming interface provided by a Servient in order to to ease the implementation of behavior or applications running in a WoT Runtime. It is comparable to the Web browser APIs. The WoT Scripting API is an optional building block for W3C WoT. Structured data describing a Thing. A WoT Thing Description comprises general metadata, domain-specific metadata, Interaction Affordances (which include the supported Protocol Bindings), and links to related Things. The WoT Thing Description format is the central building block of W3C WoT. This section presents the application domains and use cases targeted by the W3C WoT and which are used to derive the abstract architecture discussed in . The Web of Things architecture does not put any limitations on use cases and application domains. Various application domains have been considered to collect common patterns that have to be satisfied by the abstract architecture. The following sections are not exhaustive. Rather they serve as illustrations, where connected things can provide additional benefit or enable new scenarios. In the consumer space there are multiple assets that benefit from being connected. Lights and air conditioners can be turned off based on room occupancy. Window blinds can be closed automatically based on weather conditions and presence. Energy and other resource consumption can be optimized based on usage patterns and predictions. The consumer use cases in this section includes Smart Home use case. shows an example of a Smart Home. 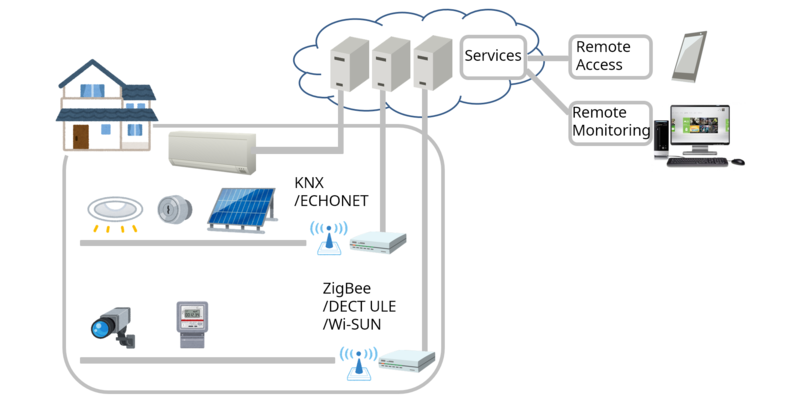 In this case, gateways are connected to edge devices such as sensors, cameras and home appliances through corresponding local communication protocols such as KNX, ECHONET, ZigBee, DECT ULE and Wi-SUN. Multiple gateways can exist in one home, while each gateway can support multiple local protocols. Gateways can be connected to the cloud through the internet, while some appliances can be connected to the cloud directly. Services running in the cloud collect data from edge devices and analyze the data, then provide value to users through the edge devices and other UX devices. Smart home provides consumer benefits such as remote access and control, voice control and home automation. Smart home also enables device manufacturers to monitor and maintain devices remotely. Smart home can realizes added value services such as energy management and security surveillance. The industrial use cases in this section are applicable to different industry verticals. Due to the nature of overlaps in the application scenarios, different verticals have similar use cases. shows an example of a Smart Factory. In this case, field-level, cell and line controllers automate different factory equipment based on industrial communication protocols such as Profinet, Modbus, OPC UA TSN, EtherCAT, or CAN. An industrial edge device collects selected data from various controllers and makes it available to a cloud backend service, e.g. for remote monitoring via a dashboard or analyzes it for preventive maintenance. Smart factories require advanced monitoring of the connected manufacturing equipment as well of the manufactured products. They benefit from predictions of machine failures and early discovery of anomalies to prevent costly downtime and maintenance efforts. Additionally, monitoring of connected manufacturing equipment and the environment at the production facility for the presence of poisonous gases, excessive noise or heat increases the safety of the workers and reduces the risks of incidents or accidents. Real-time monitoring and KPI calculations of production equipment helps to detect productivity problems and optimize the supply chain. Monitoring of vehicles, fuel costs, maintenance needs and assignments helps to optimize the full utilization of the vehicle fleet. Shipments can be tracked to be en-route to ensure consistent quality and condition of the transported goods. This is especially useful to assert the integrity of the cold-chain from warehouses to refrigerated trucks to delivery. Centralized monitoring and management of stock in warehouses and yards can prevent out of stock and excessive stock situations. Automated reading of residential and C&I (Commercial and Industrial) meters, and billing offers continuous insights into resource consumption and potential bottlenecks. Monitoring the condition and output of distributed renewable energy generation equipment enables optimization of distributed energy resources. Monitoring and remote-controlling of distribution equipment helps to automate the distribution process. Continuous monitoring of generation and distribution infrastructure is improving safety of utilities crew in the field. Offshore platform monitoring, leakage detection and prediction of pipelines as well as monitoring and controlling the levels in tanks and reservoirs helps to improve the industrial safety for the workforce as well as for the environment. Automated calculation of a distributed stock through various storage tanks and delivery pipes/trucks allows for improved planning and resource optimization. Proactive Asset Monitoring of high value assets such as connected structures, fleet vehicles, etc. mitigates the risk of severe damage and high costs due to predictions and early detection of incidents. Usage based insurance can be offered with usage tracking and customized insurance policies. Predictive weather monitoring and re-routing fleet vehicles to covered garages can limit loss due to hail damage, tree damage. Monitoring for industrial safety reduces the risks of security hazards. Monitoring of assets at construction site can prevent damage and loss. Soil condition monitoring and creating optimal plans for watering, fertilizing as well as monitoring the produce conditions optimize the quality and output of agricultural produce. Data collection and analytics of clinical trial data helps to gain insights into new areas. Remote patient monitoring mitigates the risk of undetected critical situations for elderly people and patients after hospitalization. Environment monitoring typically relies on a lot of distributed sensors that send their measurement data to common gateways, edge devices and cloud services. Monitoring of air pollution, water pollution and other environmental risk factors such as fine dust, ozone, volatile organic compound, radioactivity, temperature, humidity to detect critical environment conditions can prevent unrecoverable health or environment damages. Monitoring of Bridges, Dams, Levees, Canals for material condition, deterioration, vibrations discovers maintenance repair work and prevents significant damage. Monitoring of highways and providing appropriate signage ensures optimized traffic flow. Smart Parking is optimizing and tracking the usage and availability of parking spaces and automates billing/reservations. Smart control of street lights based on presence detection, weather predictions, etc reduced cost. Garbage containers can be monitored to optimize the waste management and the trash collection route. Monitoring the energy usage throughout the building helps to optimize resource consumption and reduce waste. Monitoring the equipment in the buildings such as HVAC, Elevators, etc. and fixing problems early improves the satisfaction of occupants. Monitoring of operation status, prediction of service needs optimizes maintenance needs and costs. Driver safety is enhanced with notifications of an early warning system for critical road and traffic conditions. shows an example of a Connected Car. In this case, a gateway connects to car components through CAN and to the car navigation system through a proprietary interface. Services running in the cloud collect data pushed from car components and analyze the data from multiple cars to determine traffic patterns. The gateway can also consume cloud services, in this case, to get traffic data and show it to the driver through the car navigation system. This section introduces common use case patterns that illustrate how devices/things interact with controllers, other devices, agents and servers. In this section, we use the term 'client roles' as an initiator of a transport protocol, and the term 'server roles' as a passive component of a transport protocol. The first use case is a local device controlled by a user-operated remote controller as depicted in . A remote controller can access an electronic appliance through the local home network directly. In this case, the remote controller can be implemented by a browser or native application. In this pattern, at least one device like the electronic appliance has a server role that can accept a request from the other devices and responds to them, and sometimes initiates a mechanical action. The other device like the remote controller has a client role that can send a message with a requests, like to read a sensor value or to turn on the device. Moreover, to emit a current state or event notification of a device, the device may have a client role that can send a message to another device, which has server roles. shows an example of a direct Thing-to-Thing interaction. The scenario is as follows: a sensor detects a change of the room condition, for example the temperature exceeding a threshold, and issues a control message like "turn on" to the electronic appliance. The sensor unit can issue some trigger messages to other devices. In this case, when two devices that have server roles are connected, at least one device must have also a client role that issues a message to the other to actuate or notify. This use case contains a mobile remote controller (e.g., on a smartphone) as shown in . The remote controller can switch between different network connections and protocols, e.g. between a cellular network and a home network, which is using protocols such as Wi-Fi and Bluetooth. When the controller is in the home network it is a trusted device and no additional security or access control is required. When it is outside of the trusted network, additional access control and security mechanisms must be applied to ensure a trusted relationship. Note that in this scenario the network connectivity may change due to switching between different network access points or cellular base stations. In this pattern, the remote controller and the electronic appliance have a client and a server role as in the related scenario in . shows a use case using a Smart Home gateway. The smart home gateway is placed between a home network and the Internet. The gateway manages electronic appliances inside the house and can receive commands from a remote controller over the Internet, e.g., from a smartphone as in the previous use case. It is also is a virtual representation of a device. The smart home gateway typically offers proxy and firewall functionality. In this pattern, the home gateway has both a client and a server role. When the remote controller actuates the electronic appliance, it can connect to the electronic appliance in the client role and to the remote controller with the server role. When the electronic appliance emits a message to the remote controller, the gateway act as server roles for the electric appliance, and it act as client roles for the remote controller. An Edge Device or Edge Gateway is similar to a Smart Home gateway. We use the term to indicate additional tasks that are carried out by the edge gateway. Whereas the home gateway in primarily just bridges between the public and the trusted network, the edge device has local compute capabilities and typically bridges between different protocols. Edge devices are typically used in industrial solutions, where they can provide preprocessing, filtering and aggregation of data provided by connected devices and sensors. A digital twin is a virtual representation, i.e. a model of a device or a group of devices that resides on a cloud server or edge device. It can be used to represent real-world devices which may not be continuously online, or to run simulations of new applications and services, before they get deployed to the real devices. Digital twins can model a single device, or they can aggregate multiple devices in a virtual representation of the combined devices. Digital twins can be realized in different ways, depending on whether a device is already connected to the cloud, or whether it is connected to a gateway, which itself is connected to the cloud. shows an example where electronic appliances are connected directly to the cloud. The cloud mirrors the appliances and, acting as a digital twin, can receive commands from remote controllers (e.g., a smartphone). Authorized controllers can be located anywhere, as the digital twin is globally reachable. The cloud mirrors the gateway with all connected appliances and acts as a digital twin that manages them in the cloud in conjunction with the gateway. Furthermore, the cloud can receive commands from remote controllers (e.g., a smartphone), which can be located anywhere. Typical IoT deployments consist of multiple (thousands) of devices. Without a standardized mechanism, the management of firmware updates for specific clouds require a lot of effort and hinders wider scale IoT adoption. The primary benefit of a standardized mechanism for describing devices and device types is the capability of deploying devices to different cloud environments without the need of doing customization at device software / firmware level, i.e. installing cloud specific code to a device. This implies that the solution is flexible enough to describe devices in a way that allows on-boarding and using devices in multiple IoT cloud environments. This drives adoption of Web of Things devices, since it enables easy usage of new devices in an existing deployment, as well as migration of existing devices from one cloud to the other. show an example of a cross-domain collaboration. In this case, each system involves other systems in other domains, such as Smart Factory with Smart City, Smart City with Smart Home. This type of system is called "Symbiotic" ecosystem, as shown in [[IEC-FOTF]]. There are two collaboration models: direct collaboration and indirect collaboration. In the direct collaboration model, systems exchange information directly with each other in a peer-to-peer manner. In the indirect collaboration, systems exchange information via some collaboration platform. In order to maintain and continue this collaboration, each system provides the metadata of their capabilities and interfaces and adapts itself to others. The previous section described various architecture patterns. In these patterns, some functional entities such as the devices including the legacy devices, controllers, gateways and cloud servers are located at physical locations such as inside building, outside buildings, and data centers. is an overview that shows the combinations and communication paths of these entities. In a transport protocol layer, each entity arbitrarily selects a suitable role for communications. For example, a device may act as a server when the device provides a service to indefinite number of applications. On the other hand, if a device has limited or intermittent network connectivity, they may act as a client and actively send message to an application when network is available. Regardless of this, in application layer, an application sees that a device provides abstract interfaces to interact and the application can interact with the device using their abstract interfaces. This section defines the properties required in an abstract Web of Things (WoT) architecture. WoT architecture should enable mutual interworking of different eco-systems using web technology. WoT architecture should be based on the web architecture using RESTful APIs. WoT architecture should allow to use multiple payload formats which are commonly used in the web. WoT architecture must enable different device architectures and must not force a client or server implementation of system components. There are a wide variety of physical device configurations for WoT implementations. The WoT abstract architecture should be able to be mapped to and cover all of the variations. There are already many existing IoT solutions and ongoing IoT standardization activities in many business fields. The WoT should provide a bridge between these existing and developing IoT solutions and Web technology based on WoT concepts. The WoT should be upwards compatible with existing IoT solutions and current standards. WoT must be able to scale for IoT solutions that incorporate thousands to millions of devices. These devices may offer the same capabilities even though they are created by different manufacturers. WoT must provide interoperability across device and cloud manufacturers. It must be possible to take a WoT enabled device and connect it with a cloud service from different manufacturers out of the box. subscribing to, receiving and unsubscribing to notifications of changes of the thing's status information. invoking functions with input and output parameters which would cause certain actuation or calculation. subscribing to, receiving and unsubscribing to event notifications that are more general than just reports of state transitions. WoT architecture should allow clients to know thing's attributes, functionalities and their access points, prior to access to the thing itself. WoT architecture should allow clients to search things by its attributes and functionalities. WoT architecture should allow semantic search of things providing required functionalities based on a unified vocabulary, regardless of naming of the functionalities. WoT architecture should support a common description mechanism which enables describing things and their functions. Such descriptions should be not only human-readable, but also machine-readable. Such descriptions should allow semantic annotation of its structure and described contents. Such description should be able to be exchanged using multiple formats which are commonly used in the web. Such descriptions should support internationalization. WoT architecture should support multiple web protocols which are commonly used. WoT architecture should allow using multiple web protocols to access to the same functionality. WoT architecture should allow using a combination of multiple protocols to the functionalities of the same thing (e.g. HTTP and WebSocket). WoT architecture should support a wide variety of thing capabilities such as edge devices with resource restrictions and virtual things on the cloud, based on the same model. WoT architecture should support multiple levels of thing hierarchy with intermediate entities such as gateways and proxies. WoT architecture should support accessing things in the local network from the outside of the local network (the internet or another local network), considering network address translation. WoT architecture should allow describing applications for a wide variety of things such as edge device, gateway, cloud and UI/UX device, using web standard technology based on the same model. WoT architecture should allow mapping of legacy IP and non-IP protocols to web protocols, supporting various topologies, where such legacy protocols are terminated and translated. WoT architecture should allow transparent use of existing IP protocols without translation, which follow RESTful architecture. WoT architecture must not enforce client or server roles on devices and services. An IoT device can be either a client or a server, or both, depending on the system architecture; the same is true of edge and cloud services. defines the Web of Things abstract architecture by showing various use cases and enumerating patterns for combining architectural components. This section describes technical requirements derived from the abstract architecture. The use cases help to identify basic components such as devices and applications, that access and control those devices, proxies (i.e. gateways and edge devices) that are located between devices. An additional component useful in some use cases is the directory, which assists with discovery. Those components are connected to the internet or field networks in offices, factories or other facilities. Note that all components involved may be connected to a single network in some cases, however, in general components can be deployed across multiple networks. Access to devices is made using a descriptions of their functions and interfaces. This description is called Thing Description (TD). A Thing Description includes a general metadata about the device, information models representing functions, transport protocol description for operating on information models, and security information. General metadata contains device identifiers (URI), device information such as serial number, production date, location and other human readable information. Information models defines device attributes, and represent device’s internal settings, control functionality and notification functionality. Devices that have the same functionality have the same information model regardless of the transport protocols used. Because many systems based on Web of Things architecture are crossing system Domains, vocabularies and meta data (e.g. ontologies) used in information models should be commonly understood by involved parties. In addition to REST transports, PubSub transports are also supported. Security information includes descriptions about authentication, authorization and secure communications. Devices are required to put TDs either inside them or at locations external to the devices, and to make TDs accessible so that other components can find and access them. Applications need to be able to generate and use network and program interfaces based on metadata (descriptions). Applications have to be able to obtain these descriptions through the network, therefore, need to be able to conduct search operations and acquire the necessary descriptions over the network. Digital Twins need to generate program interfaces internally based on metadata (descriptions), and to represent virtual devices by using those program interfaces. A twin has to produce a description for the virtual device and make it externally available. Identifiers of virtual devices need to be newly assigned, therefore, are different from the original devices. This makes sure that virtual devices and the original devices are clearly recognized as separate entities. Transport and security mechanisms and settings of the virtual devices can be different from original devices if necessary. Virtual devices are required to have descriptions provided either directly by the twin or to have them available at external locations. In either case it is required to make the descriptions available so that other components can find and use the devices associated with them. For TDs of devices and virtual devices to be accessible from devices, applications and twins, there needs to be a common way to share TDs. Directories can serve this requirement by providing functionalities to allow devices and twins themselves automatically or the users to manually register the descriptions. Descriptions of the devices and virtual devices need to be searchable by external entities. Directories have to be able to process search operations with search keys such as keywords from the general description in the device description or information models. Security information related to devices and virtual devices needs to be described in device descriptions. This includes information for authentication/authorization and payload encryption. WoT architecture should support multiple security mechanism commonly used in the web, such as Basic, Digest, Bearer and OAuth2.0. The Web of Things primarily targets machine-to-machine communication. The humans involved are usually developers that integrate Things into applications. End-users will be faced with the front-ends of the applications or the physical user interfaces provided by devices themselves. Both are out of scope of the W3C WoT specifications. Given the focus on IoT instead of users, accessibility is not a direct requirement, and hence is not addressed within this document. There is, however, an interesting aspect on accessibility: Fulfilling the requirements above enables machines to understand the network-facing API of devices. This can be utilized by accessibility tools to provide user interfaces of different modality, thereby removing barriers to using physical devices and IoT-related applications. To address the use cases in Section 4 and fulfill the requirements in Section 5, the Web of Things (WoT) builds on top of the concept of Web Things – usually simply called Things – that can be used by so-called Consumers. This section provides the background and normative assertions to define the overall W3C Web of Things architecture. As the Web of Things addresses stakeholders from different domains, certain aspects of Web technology are explained in more detail, in particular the concept of hypermedia. A Thing is the abstraction of a physical or virtual entity (e.g., a device or a room) and is described by standardized metadata. In W3C WoT, the description metadata MUST be a WoT Thing Description (TD) [[!wot-thing-description]]. Consumers MUST be able to process the WoT Thing Description format, which is based on JSON [[!RFC8259]]. The format can be processed either through classic JSON libraries or a JSON-LD processor, as the underlying information model is graph-based and its serialization compatible with JSON-LD 1.1 [[?json-ld-syntax]]. A TD is instance-specific (i.e., describes an individual Thing, not types of Things) and is the default Web representation of a Thing. There MAY be other representations of a Thing such as an HTML-based user interface, simply an image of the physical entity, or even non-Web representations in closed systems; to be a Thing, however, one TD representation MUST be available. The WoT Thing Description is a standardized, machine-understandable representation format that allows Consumers to discover and interpret the capabilities of a Thing (through semantic annotations) and to adapt to different implementations (e.g., different protocols or data structures) when interacting with a Thing, thereby enabling interoperability across different IoT platforms, i.e., different ecosystems and standards. Simple figure to illustrate Consumer--Thing interaction. A Thing can also be the abstraction of a virtual entity. A virtual entity is the composition of one or more Things (e.g., a room consisting of several sensors and actuators). One option for the composition is to provide a single, consolidated WoT Thing Description that contains the superset of capabilities for the virtual entity. In cases where the composition is rather complex, its TD may link to hierarchical sub-Things within the composition. The main TD acts as entry point and only contain general metadata and potentially overarching capabilities. This allows grouping of certain aspects of more complex Things. Linking does not only apply to hierarchical Things, but relations between Things and other resources in general. Link relation types express how Things relate, for instance, a switch controlling a light or a room monitored by a motion sensor. Other resources related to a Thing can be manuals, catalogs for spare parts, CAD files, a graphical UI, or any other document on the Web. Overall, Web linking among Things makes the Web of Things browsable, for both humans and machines. This can be further facilitated by providing Thing directories that manage an index of available Things, usually by caching their TD representation. In summary, WoT Thing Descriptions MAY link to other Things and other resources on the Web to form a Web of Things. Figure to illustrate linked Things. Things must be hosted on networked system components with a software stack to realize interaction through a network-facing interface, the WoT Interface of a Thing. One example of this is an HTTP server running on an embedded device with sensors and actuators interfacing the physical entity behind the Thing abstraction. However, W3C WoT does not mandate where Things are hosted; it can be on the IoT device directly, an Edge device such as a gateway box, or the cloud. A typical deployment challenge is that local networks are not reachable from the Internet, usually because of IPv4 NATs or firewalls. To remedy this situation, W3C WoT allows for Intermediaries between Things and Consumers. Intermediaries can act as proxies for Things, where the Intermediary has a WoT Thing Description similar to the original Thing, but which points to the WoT Interface provided by the Intermediary. Intermediaries may also augment existing Things with additional capabilities or compose a new Thing out of multiple available Things, thereby forming a virtual entity. To Consumers, Intermediaries look like Things, as they possess WoT Thing Descriptions and provide a WoT Interface, and hence might be indistinguishable from Things in a layered system architecture like the Web [[?REST]]. An identifier in the WoT Thing Description MUST allow for the correlation of multiple TDs representing the same original Thing or ultimately unique physical entity. Another remedy for unreachable local networks would be to bind the WoT Interface to a protocol that establishes the connection from the Thing within the local network to a publicly reachable Consumer. Things MAY be bundled together with a Consumer to enable Thing-to-Thing interaction. Usually, the Consumer behavior is embedded in the software also implementing the behavior of the Thing. The configuration of the Consumer behavior MAY be exposed through the Thing. The concepts of W3C WoT are applicable to all levels relevant for IoT applications: the device level, edge level, and cloud level. This fosters common interfaces and APIs across the different levels and enables various integration patterns such as Thing-to-Thing, Thing-to-gateway, Thing-to-cloud, gateway-to-cloud, and even cloud federation for IoT applications. gives an overview how the WoT concepts introduced above can be applied and combined to address the use cases summarized in . A central aspect in W3C WoT is the provision of machine-understandable metadata (i.e., WoT Thing Descriptions). Ideally, such metadata is self-descriptive, so that Consumers are able to identify what capabilities a Thing provides and how to use the provided capabilities. A key to this self-descriptiveness lies in the concept of affordances. An example for this is a door with a handle. The door handle is an affordance, which suggests that the door can be opened. For humans, a door handle usually also suggests how the door can be opened; an American knob suggests twisting, a European lever handle suggests pressing down. The hypermedia principle, which is one of the bedrock foundations of the REST architectural style [[?REST]], demands that any piece of information available on the Web be linked to other pieces of information so that the consumer of the information gets explicit knowledge about how to navigate the Web and control Web applications. Here, the simultaneous presentation of information and control (provided in the form of hyperlinks) is a mechanism that affords Web clients the means to drive Web applications. In this context, an affordance is the description of a hyperlink (e.g., via a link relation type and link target attributes) suggesting Web clients how to navigate and possibly how to act on the linked resource. Hence, links provide navigation affordances. Drawn from this hypermedia principle, the Web of Things defines Interaction Affordances as metadata of a Thing that shows and describes the possible choices to Consumers, thereby suggesting how Consumers may interact with the Thing. A general Interaction Affordance is navigation, which is activated by following a link, thereby enabling Consumers to browse the Web of Things. defines three more types of Interaction Affordances for W3C WoT: Properties, Actions, and Events. Overall, this W3C WoT definition is aligned with HCI and interaction designers, who create physical Things, as well as the REST and microservice community, who is working on Web services in general. A Web Thing has four architectural aspects of interest: its behavior, its Interaction Affordances, and its security configuration. See . The behavior aspect of a Thing includes both lifecycle management (onboarding, updating, decommissioning, etc.) but also the operational behavior of the Thing, which can include both autonomous behavior and support for interactions. Interactions have two parts, the interaction affordances which are presented externally, and the interaction implementation, which defines the actual behavior corresponding to the interaction. The interaction affordances provide a model of the network API using a set of abstract operations, but without reference to a specific network protocol or payload encoding. The protocol binding adds the additional detail needed to map each interaction affordance to operations in a particular concrete protocol. In general, different concrete protocols may be used to support different subsets of interaction affordances even within a single Thing. The security configuration aspect of a Thing represents the mechanisms used to control access to the affordances and the management of related public and private metadata. shows these aspects in a diagram. Originally, a Web resource usually represented a document on the World Wide Web that can simply be fetched by a Web client. With the introduction of Web services, resources became more generic interaction entities that can implement any kind of behavior. This very high level of abstraction makes it hard to provide a loose coupling between applications and resources due to the manifold interaction possibilities. As a result, at the time of writing typical API descriptions consist of a static mapping from an application intent to a resource address, method, request payload structure, response payload structure, and expected errors. This imposes a tight coupling between Web client and Web service. The Interaction Model of W3C WoT introduces an intermediate abstraction that formalizes the mapping from application intent to concrete protocol operations and also narrows the possibilities how Interaction Affordances can be modeled. In addition to navigation affordances (i.e., Web links), Things MAY offer three other types of Interaction Affordances defined by this document: Properties, Actions, and Events. While this narrow waist allows to decouple Consumers and Things, these four types of Interaction Affordances are still able to model virtually all interaction possibilities found in IoT devices and services. A Property is an Interaction Affordance that exposes state of the Thing that MUST be retrievable (read) and optionally MAY be updated (write). Things MAY choose to make Properties observable by pushing the new state after a change (cf. Observing Resources [[?RFC7641]]). Write-only state should be updated through an Action. Properties MAY contain one data schema if the data is not fully specified by the Protocol Binding used (e.g., through a Media Type). Examples of Properties are sensor values (read-only), stateful actuators (read-write), configuration parameters (read-write), Thing status (read-only or read-write), or computation results (read-only). An Action is an Interaction Affordance that allows to invoke a function of the Thing, which MAY manipulate state that is not directly exposed (cf. Properties), manipulate multiple Properties at a time, or manipulate Properties based on internal logic (e.g., toggle). Invoking an Action MAY also trigger a process on the Thing that manipulates state (including physical state through actuators) over time. Actions MAY contain up to two data schemas, one for optional input parameters and one for output results, if the data is not fully specified by the Protocol Binding used (e.g., through a Media Type). Examples of Actions are changing multiple Properties simultaneously, changing Properties over time such as fading the brightness of a light (dimming) or with a process that shall not be disclosed such as a proprietary control loop algorithm, or invoking a long-lasting process such as printing a document. An Event Interaction Affordance describes an event source that pushes data asynchronously from the Thing to the Consumer. Here not state, but state transitions (i.e., events) are communicated. Events MAY be triggered through conditions that are not exposed as Properties. Events MAY contain up to three data schemas, one for the event data if the data is not fully specified by the Protocol Binding used (e.g., through a Media Type), optionally one for the subscription data if the message to subscribe is not implicitly known from the Protocol Binding used (e.g., Server-Sent Events vs Web hooks), and optionally one for the cancellation data if the messages to unsubscribe is not implicitly known from the Protocol Binding used (e.g., WebSockets vs Web hooks). Examples of Events are discrete events such as an alarm or samples of a time series that are pushed regularly. On the Web, an affordance is the simultaneous presentation of information and controls, such that the information becomes the affordance through which the user obtains choices. For humans, the information is usually text or images describing or decorating a hyperlink. The control is a Web link, which contains at least the URI of the target resource, which can be dereferenced by the Web browser (i.e., the link can be followed). But also machines can follow links in a meaningful way, when the Web link is further described by a relation type and a set of target attributes. A hypermedia control is the machine-understandable serialization of how to activate an affordance. Hypermedia controls usually originate from a Web server and are discovered in-band while a Web client is interacting with the server. This way, Web servers can drive clients through Web applications dynamically, by taking their current state and other factors such as authorization into account. This is opposed to out-of-band interface descriptions that need to be preinstalled or hardcoded into clients (e.g., RPC, WS-* Web services, HTTP services with fixed URI-method-response definitions). W3C WoT makes use of two kinds of hypermedia controls: Web links [[!RFC8288]] as the well-established control to navigate the Web, and Web forms as a more powerful control to enable any kind of operation. The same concept is used in the Constrained RESTful Application Language (CoRAL) defined by the IETF [[?CoRAL]]. Links enable Consumers (or Web clients in the broader sense) to change the current context (cf. the set of resource representations currently rendered in the Web browser) or to include additional resources into the current context, depending on the relation between context and link target. Consumers do so by dereferencing the target URI, that is, fetching the resource representation by following a link. In the Web of Things, links are used for discovery and to express relations between Things (e.g., hierarchical or functional) and relations to other documents on the Web (e.g., manuals or alternative representations such as CAD models). Forms enable Consumers (or Web clients in the broader sense) to perform operations that go beyond dereferencing a URI (e.g., manipulating state of a Thing). Consumers do so by filling out and submitting the form to its submission target. This usually requires more detailed information about the necessary request message than a link can provide (e.g., method, header fields, or other protocol options). Forms can be seen as a request template, where the provider prefilled parts of the information according to its own interface and state, and left parts blank to be filled by the Consumers (or Web client in general). A form can be viewed as a statement of "To perform a operation type operation on form context , make a request method request to submission target " where the optional form fields may further describe the required request. Form contexts and submission targets are both Internationalized Resource Identifiers (IRIs) [[!RFC3987]]. However, in the common case, they will also be URIs [[!RFC3986]], because many protocols (such as HTTP) do not support IRIs. Form context and submission target MAY point to the same resource or different resources, where the submission target resource implements the operation for the context. Well-known operation types MUST follow the ABNF LOALPHA *( LOALPHA / DIGIT / "." / "-" ). Well-known operation types MUST be compared character by character in a case-insensitive fashion. The well-known operation types for the Web of Things defined by this specification are given in Table 1. Extension operation types MAY be chosen by applications. Extension operation types MUST be URIs [[!RFC3986]] that uniquely identify the type. Extension operation types MUST be compared as strings (after converting to URIs if serialised in a different format) character by character in a case-insensitive fashion. Because of this, all-lowercase URIs SHOULD be used for extension operation types. The request method MUST identify one method of the standard set of the protocol identified by the submission target URI scheme. Form fields are optional and MAY further specify the expected request message for the given operation. Note that this is not limited to the payload, but may affect also protocol headers. Form fields MAY depend on the protocol used for the submission target (i.e., URI scheme). Examples are HTTP header fields, CoAP options, the protocol-independent Media Type including parameters (i.e., full content type) for the submission payload, or information about the expected response. readproperty Identifies the read operation on Property Affordances to retrieve the corresponding data. writeproperty Identifies the write operation on Property Affordances to update the corresponding data. observeproperty Identifies the observe operation on Property Affordances to be notified with the new data when the Property was updated. unobserveproperty Identifies the unobserve operation on Property Affordances to stop the corresponding notifications. invokeaction Identifies the invoke operation on Action Affordances to perform the corresponding action. subscribeevent Identifies the subscribe operation on Event Affordances to be notified by the Thing when the event occurs. unsubscribeevent Identifies the unsubscribe operation on Event Affordances to stop the corresponding notifications. readallproperties Identifies the readallproperties operation on Things to retrieve the data of all Properties in a single interaction. writeallproperties Identifies the writeallproperties operation on Things to update the data of all writable Properties in a single interaction. readmultipleproperties Identifies the readmultipleproperties operation on Things to retrieve the data of selected Properties in a single interaction. writemultipleproperties Identifies the writemultipleproperties operation on Things to update the data of selected writable Properties in a single interaction. As of this specification, the well-known operation types are a fixed set that results from the WoT Interaction Model. Other specifications may define further well-known operation types that are valid for their respective document format or form serialization. Updates to this specification or another specification may set up an IANA registry in the future to enable extension and a more generic Web form model that may be applied beyond WoT specifications. A Protocol Binding is the mapping from an Interaction Affordance to concrete messages of a specific protocol such as HTTP [[!RFC7231]], CoAP [[!RFC7252]], or MQTT [[!MQTT]]. It informs the Consumer how to activate the Interaction Affordance through a network-facing interface. The Protocol Bindings follow the Uniform Interface constraint of REST [[?REST]] to support interoperability. In the door example given in , the Protocol Binding corresponds to the door handle at the level of knob vs lever, which suggests how the door can be opened. Interaction Affordances MUST contain one ore more Protocol Bindings, which MUST be serialized as hypermedia controls (see ) to to be self-descriptive on how to activate the Interaction Affordance. The hypermedia controls MUST originate from the authority managing the Thing providing the corresponding Interaction Affordance. The authority can be the Thing itself, serializing the WoT Thing Description at runtime based on its current state including network parameters such as its IP address, or an external entity that has full and fresh knowledge of the Thing including its network parameters and software stack. This enables a loose coupling between Things and clients, allowing for an independent lifecycle and evolution. The hypermedia controls MAY be cached outside the Thing and used for offline processing if corresponding caching metadata is available to determine the freshness. Eligible protocols for W3C WoT MUST have an associated URI scheme that is registered with IANA [[!RFC4395]]. Hypermedia controls rely on URIs to identify link and submission targets. Thereby, the URI scheme (the first component up to ":") identifies the communication protocol to be used for interaction with the Thing. W3C WoT refers to these protocols as transfer protocols. Eligible protocols for W3C WoT MUST be based on a standard set of methods that is known a priori. The standard set of methods makes messages self-descriptive to enable intermediate processing of interactions, for instance by proxies or to translate between Protocol Bindings [[?REST]]. Furthermore, it allows Consumers to have re-usable protocol stacks of common transfer protocols such as HTTP, CoAP, or MQTT, avoiding Thing-specific code or plugins for Consumers. All data (a.k.a. content) exchanged when activating Interaction Affordances MUST be identified by a Media Type [[!RFC6838]] within the Protocol Binding. Media Types are IANA-managed labels to identify representation formats, for instance application/json for JSON [[!RFC8259]] or application/cbor for CBOR [[!RFC7049]]. Note that many Media Types only identify a generic serialization format that does not provide further semantics for its elements (e.g., XML, JSON, CBOR). Thus, the corresponding Interaction Affordances SHOULD declare a data schema to provide more detailed semantic metadata for the data exchanged. This section illustrates the behavior of WoT components using system configuration diagrams. shows direct communication between a WoT Server, that is exposing a thing and a WoT Client that is using it. Direct communication applies when both components use the same network protocol(s) and are accessible to each other. Conceptually, a WoT Server can be thought to have an Exposed Thing that provides an interface that conforms to the TD. A WoT Client can be considered to contain a Consumed Thing for each of the WoT Servers it connects to that provides a programming interface that can be used by applications. A WoT Client can generate a Consumed Thing instance by interpreting a TD. Communication between the WoT Client and the WoT Server is performed by exchanging messages over a direct network connection between a Consumed Thing and an Exposed Thing. In a WoT Client and a WoT Server connect to each other via a proxy. A proxy is required as an intermediary if the components use different protocols (gateway) or if they are on different networks that require authentication and provide access control (e.g. firewalls). A proxy combines Exposed Thing and Consumed Thing functionality, and relays messages that are exchanged between a WoT Client and a WoT Server. In a proxy, a Consumed Thing creates a shadow thing instance of the Exposed Thing of a WoT Server, and a WoT Client can access the shadow instance through the Exposed Thing of the proxy. The Exposed Thing and Consumed Thing of a proxy can communicate with the WoT Client and the WoT Server in different protocols. For example, a proxy can provide a bridge between a device that uses CoAP and an application that uses HTTP. Even when there are multiple devices and they use different protocols, an application can communicate with those devices using a single protocol through the proxy. The same is true for device authentication. A client only needs to handle a single authentication method even when multiple devices connected to a proxy use different authentication methods. A proxy creates a Consumed Thing based on a TD and generates another TD for a shadow thing instance. The TD for a shadow device uses a new identifier different from the original device TD’s, and contains interfaces for other communication protocols if necessary. A proxy then creates an Exposed Thing that implements the bridge to the originating thing. A client communicates with a device via a proxy through a Consumed Thing that conforms to the TD for the shadow thing instance. The Web of Things (WoT) Building Blocks allow the implementation of systems that conform with the abstract WoT Architecture. The specifics of these building blocks are defined in separate documents; this chapter provides an overview and a summary. The WoT Building Blocks support each of the architectural aspects of a Thing discussed in and diagrammed in . The building blocks themselves are shown in the context of an abstract Thing in . This is an abstract view and is not meant to represent any particular implementation; instead it is meant to illustrate the relationship between the building blocks and the main architectural aspects of a Thing. In this figure the WoT Building Blocks are highlighted with black outlines. Security, a cross-cutting concern, is separated into public and protected private components. The WoT Scripting API is optional and the Binding Templates are informative. Relationship of WoT Building Blocks to the Architectural Aspects of a Thing. The WoT Thing Description (TD) contains metadata describing the interaction affordances of the Thing, the mapping of these affordances onto concrete network protocols (the communication metadata), the public security data needed by authorized users to understand how to access the Thing, and other general metadata such as IDs, names, and descriptions. The Binding Templates are another WoT building block that provides guidance on how to provide the correct communications metadata in a TD to support specific target protocols. The interaction implementation specifies how a Thing actually responds to an interaction, including how state is stored and modified. The behavior implementation specifies how other behavior of a Thing is implemented, which may or may not be directly related to an interaction. For example, a thermostat may need to execute a control loop to control a furnace based on a sensor reading. This does not directly relate to a specific interaction, although it might be controlled by a property (such as target temperature) that can be modified by an interaction. For specifying behavior and interaction implementations, an optional WoT Scripting API building block is provided which supports the definition and consumption of WoT Thing Descriptions. This is useful to define application behavior using an easy-to-use scripting language. It is however possible to implement a WoT Thing without using the WoT Scripting API. In this case the externally visible interactions and network interface still needs to be consistent with the Thing Description defined for the Thing. Internally to a Thing, it is also generally important to provide secure storage for private security data such as encryption keys and identity material. This information is never directly shared with entities outside the Thing, and ideally should not even be available to the behavior and interaction implementations. Instead an abstract set of operations should support security functions such as signing, authorization, certificate validation, as well as encryption and decryption. Technology such as asymmetric public encryption schemes are generally used to provide these functions without disclosing the secret private security data. In general, explicitly managing secrets in a form that is easily updated if necessary and keeping them clearly separated from public information is considered a security best practice. In particular storing secrets as random numeric values rather than attempting to obfuscate the implementation or network interface is strongly recommended. If a numeric value is disclosed it is easily changed. This is not true of an implementation or network interface. In the following sections we will provide additional information on each WoT Building Block: the WoT Thing Description, the WoT Binding Templates, and the WoT Scripting API. Security, although it is a cross-cutting concern, can be considered a fourth building block. The WoT Thing Description (TD) document [[!wot-thing-description]] defines an information model based on a semantic vocabulary and a serialized representation based on JSON. TDs provide rich metadata for Things in a way that is both human-readable and machine-understandable. Both the information model and the representation format of TDs are aligned with Linked Data [[?LINKED-DATA]], so that besides raw JSON processing, implementations may choose to make use of JSON-LD [[?JSON-LD11]] and graph databases to enable powerful semantic processing of the metadata. A Thing Description (TD) describes Thing instances with general metadata such as name, ID, descriptions, and also can provide relation metadata through links to related Things or other documents. TDs also provide interaction affordance metadata based on the interaction model defined in ; public security configuration metadata; and communications metadata defining protocol bindings. The TD can be seen as the index.html for Things, as it provides the entry point to learn about the provided services and related resources, both of which are described using hypermedia controls. Ideally, the TD is created and/or hosted by the Thing itself and retrieved upon discovery. Yet it can also be hosted externally when a Thing has resource restrictions (e.g., limited memory space, limited power) or when an existing device is retrofitted to become part of the Web of Things. A common pattern is to register TDs with a directory to improve discovery (e.g., for constrained devices) and to facilitate device management. It is recommended that clients should use TD caching combined with notifications when they are paired with a Thing, meaning that they will be notified to fetch a fresh TD representation in case the Thing is updated. For semantic interoperability, TDs may make use of a domain-specific vocabulary, for which explicit extension points are provided. However, development of any particular domain-specific vocabulary is currently out-of-scope of the W3C WoT standardization activity. Three examples of potentially useful external IoT vocabularies are SAREF [[?SAREF]], iot.schema.org [[?iot-schema-org]], and the W3C Semantic Sensor Network ontology [[?SSN]]. Use of such external vocabularies in TDs is optional. In the future additional domain-specific vocabularies may be developed and used with TDs. Overall, the WoT Thing Description building block fosters interoperability in two ways: First, TDs enable machine-to-machine communication in the Web of Things. Second, TDs can serve as a common, uniform format for developers to document and retrieve all the details necessary to create applications that can access IoT devices and make use of their data. The IoT uses a variety of protocols for accessing devices, since no one protocol is appropriate in all contexts. Thus, a central challenge for the Web of Things is to enable interactions with the plethora of different IoT platforms (e.g., OCF, oneM2M, OMA LWM2M, OPC UA) and devices that do not follow any particular standard, but provide an eligible interface over a suitable network protocol. WoT is tackling this variety through Protocol Bindings, which must meet a number of constraints (see ). The non-normative WoT Binding Templates document [[?wot-binding-templates]] provides a collection of communication metadata blueprints that provide guidance on how to interact with different IoT platforms. When describing a particular IoT device or service, the Binding Template for the corresponding IoT Platform can be used to look up the communication metadata that must be provided in the Thing Description to support that platform. IoT Platform: IoT Platforms often introduce proprietary modifications at the application layer such as platform-specific HTTP header fields or CoAP options. Forms (see ) may contain the necessary information to apply these tweaks in additional form fields defined for the application-layer protocol used. Media Type: IoT Platforms often differ in the representation formats (or serializations) used for exchanging data. The Media Type [[!RFC6838]] identifies these formats, while parameters may specify them further. Forms may contain the Media Type and optional parameters in additional form fields. Transfer Protocol: The Web of Things uses the term transfer protocol for the underlying, standardized application layer protocol without application-specific options or subprotocol mechanisms. The URI scheme of the form submission target contains the necessary information to identify the transfer protocol, e.g., HTTP, CoAP, or WebSockets. Subprotocol: Transfer protocols may have extension mechanisms that must be known to interact successfully. Such subprotocols cannot be identified from the URI scheme and must be declared explicitly. Examples are the push notification workarounds for HTTP such as long polling [[?RFC6202]] or Server-Sent Events [[?EVENTSOURCE]]. Forms may contain the necessary information to identify the subprotocol in additional form fields. Security: Security mechanisms can be applied at different layers of the communication stack and might be used together, often to complement each other. Examples are (D)TLS [[?RFC5246]]/[[?RFC6347]], IPSec [[?RFC6071]], OAuth [[?RFC6749]], and ACE [[?RFC7744]]. Due to the cross-cutting nature of security, the necessary information to apply the right mechanism may be given within the general metadata of the Thing. The WoT Scripting API is an optional "convenience" building block in WoT that eases IoT application development and is implemented using a Scripting Runtime (such as a Python, Lua or ECMAScript implementation) that is used in combination with a WoT Runtime. The WoT Scripting API enables writing WoT applications by user-defined scripts. Traditionally, IoT device logic is implemented in firmware, which results in productivity constraints similar to that of embedded development, including a relatively complex update process. The WoT Scripting API in contrast supports enables implementing device logic by reusable scripts executed in a runtime system for IoT applications not dissimilar to that of a Web browser, and aims to improve productivity and reduce integration costs. Furthermore, standardized APIs enable portability for application modules, for instance, to move compute-intense logic from a device up to a local gateway, or to move time-critical logic from the cloud down to a gateway or edge node. The non-normative WoT Scripting API document defines the structure and algorithms of the programming interface that allows scripts to discover, consume (retrieve) and produce (define) Thing Descriptions. The implementation of the WoT Scripting API instantiates local objects that act as an interface to other Things and represents their Interaction Affordances (Properties, Actions, and Events). It also allows scripts to expose Things, i.e. to specify and implement Interaction Affordances and publish a Thing Description. The standardized WoT Scripting API provides a contract between application scripts and the WoT Runtime in a Servient and is built on top of the Thing abstraction and the TD Interaction Model. Security is a cross-cutting concern and should be considered in all aspects of system design. In the WoT architecture, security is supported by certain explicit features, such as support for public security metadata in TDs and by separation of concerns in the design of the WoT Scripting API. The documents defining each building block also include a discussion of particular security and privacy considerations for each building block. Another set of documents, the WoT Security and Privacy Considerations [[?wot-security]], the WoT Security Best Practices [[?WOT-SECURITY-BEST-PRACTICES]], and the WoT Security Testing Plan [[?WOT-SECURITY-TESTING-PLAN]], provide additional non-normative security and privacy guidance. A Servient is a software stack that implements the WoT building blocks presented in the previous section. Servients can host and expose Things and/or consume Things. Thus, Servients can perform in both the WoT Server and WoT Client roles; the name (a portmanteau of server and client) is based on this dual role. The previous sections and chapter describes how the WoT building blocks conceptually relate to each other and to the abstract architecture. When implementing these concepts, a more detailed view is necessary that takes certain technical aspects into account. The detailed architecture of a Servient implementation using the (optional) WoT Scripting API is shown in . This figure shows and implementation that is using the optional WoT Scripting API. Scripts are actually executed by a nested Scripting Runtime, while WoT-specific Servient Implementation aspects are managed by the WoT Runtime. Consumed Thing and Exposed Thing objects provide abstract interfaces to the Things described in related Thing Descriptions. Scripts can operate on Things using these abstractions by performing abstract Interactions while the details of the Protocol Bindings are managed automatically by the WoT Runtime. Implementation of a Servient Using the Optional WoT Scripting API. The role and functionality of each additional module shown in is given in the following sections. Applications running on a Servient provide implementations of interactions (for example, what the Servient actually does when a certain action is invoked) and optionally other behaviors, such as control loops or support for local user interfaces. The WoT Scripting API is one way to implement an application using an application script, and is described in more detail below. Application scripts run inside a Scripting Runtime nested inside the WoT Runtime but have access to objects and interfaces defined by WoT Runtime. The WoT Runtime and WoT Scripting API provide Exposed Thing abstractions that represent Things exposed by the Servient (network interfaces presented to the outside when the Servient is acting as a server) and Consumed Thing abstractions representing other Things the Servient can communicate with in a client role. In the WoT Scripting API these abstractions are represented by actual object instances. These objects provide an abstract interface at the level of interactions, not specific protocols. The WoT Runtime manages the translation of these higher-level interactions to concrete protocol transactions using the Protocol Binding. Private security metadata is also conceptually managed by the WoT Runtime but is intentionally not made directly accessible to the application. In fact, in the most secure hardware implementations, such private security data is stored in a separate, isolated memory and only an abstract set of operations (possibly even implemented by an isolated processor and software stack) is provided that limit the attack surface and prevent external disclosure of this data. Private security data is used transparently by the Protocol Binding to authorize and protect the integrity and confidentiality of interactions. The WoT Scripting API specification describes a low level ECMAScript API that follows the WoT Thing Description specification closely. Other, simpler APIs may be implemented on top of it. In principle, any programming language and API can be used in order to define the behavior of a Thing, as long as the Interaction Affordances are presented externally through Protocol Bindings and (optionally) access to the information encoded in Thing Descriptions is provided. (Ideally via Consumed Thing and Exposed Thing abstractions, which are providing similar functionality to the objects in the WoT Scripting API). The current reference implementation of the Scripting API is the open-source Eclipse ThingWeb (node-wot) project. This API is the only one at the moment that currently ensures "de facto" portability of WoT scripts. See WoT Scripting API for more details. At a low level, the Thing abstraction and Interaction Model is implemented in a runtime system that is independent of but supports the WoT Scripting API. This WoT Runtime also interfaces with the Protocol Bindings subsystem to access remote Things and (optionally) with the system API to access local hardware and proprietary communication protocols. Both local hardware and devices behind proprietary communications protocols may also represented as Things in the runtime environment, that is, they can be made accessible via Consumed Thing abstractions. The WoT Runtime is also tasked with generating and exposing a Thing Description based on general metadata (e.g., location), application metadata (e.g., Interaction Affordance), and communication metadata for the available Protocol Bindings (e.g., based on WoT Binding Templates). When the WoT Scripting API is used an additional nested Scripting Runtime is needed, which is a language runtime to actually manage and execute scripts. The Scripting Runtime runs inside of but is distinct from the WoT Runtime. Certain operations are needed to manage the lifecycle of an exposed Thing such as retrieving and/or serving a Thing Description, instantiating an Exposed Thing abstraction based on the Thing Description, and terminating an Exposed Thing. The details of such operations vary among different kinds of devices. A WoT Servient Life Cycle Management (LCM) system encapsulates those lifecycle operations. It uses internal interfaces to realize the lifecycle management of exposed Things. The LCM is a system component that integrates with the WoT Runtime. The WoT Scripting API provides one implementation of the LCM functionality. For a WoT Client or Servient, the lifecycle management of Consumed Things is realized in the same manner as that of Exposed Things. Protocol Bindings are implementations of the Binding Templates. They produce the concrete protocol transactions to interact with other Things over the network based on the communication metadata given in the Thing Description of the Consumed Thing. Servients may have multiple Protocol Bindings to enable interaction with different IoT Platforms. In many cases, where standard protocols are used, generic protocol stacks can be used to produce the platform-specific messages (e.g., one for HTTP(S) dialects, one for CoAP(S) dialects, and one for MQTT solutions, etc.). In this case, the communication metadata from the Thing Description is used to select and configure the right stack (e.g., HTTP with the right header fields or CoAP with the right options). Parsers and serializers for the expected payload representation format (JSON, CBOR, XML, etc.) as identified by the Internet Media Type can also be shared across these generic protocol stacks. In some cases, where no aspects can be shared, the Protocol Binding is more comparable to a platform-specific driver that is selected and configured through the communication metadata in similar way as above. See WoT Binding Templates for details. The implementation of a Thing may access local hardware or system services (e.g. storage) through proprietary APIs or other means. This block is out of scope of WoT standardization. However, a given implementation of a WoT Runtime may provide local hardware or system services to application scripts through a Thing abstraction, as if they were accessible over a network protocol. In this case the implementation should be optimized to avoid the overhead that would be involved in a literal implementation of a network protocol while maintaining a consistent WoT Interface. A device may also be physically external to a Servient, but connected via a proprietary protocols or a protocol not eligible for direct support as part of the WoT. In this case, the implemented runtime environment may access legacy devices with such protocols (e.g., Echonet Lite, BACNET, X10, I2C, SPI, etc.) through proprietary APIs, but may again choose to expose them to applications via a Thing abstraction. A Servient can then act as gateway to the legacy devices. This should only be done if the legacy device cannot be described directly using a WoT Thing Description. The WoT Scripting API building block is optional. Alternative Servient implementations are possible where applications are implemented using alternative APIs internally. There are two possibilities for such implementations: those that use the WoT Runtime but use an alternative API and programming language for defining an application; and those that do not use a WoT Runtime but are implemented using a separate software stack. The second case can still be incorporated into a WoT system if they use a WoT-supported protocol and a Thing Description can be provided for such devices or services. There are various reasons why a developer may choose to implement a Servient without using the WoT Scripting API. This may be due to insufficient memory or computing resources, so the developer can't use the required software stack or a fully-featured scripting engine. Alternatively, to support their use case (for example, a proprietary communications protocol) the developer may have to use specific functions or libraries only available through a particular programming environment or language. In this case, a WoT Runtime can still be used, but with the equivalent abstraction and functionality exposed using an alternative WoT API instead of through the WoT Scripting API. It is also possible to support existing IoT devices or services in the WoT and integrate them with other WoT Things by writing a Thing Description for them. This can only be done however if the target device is using protocols eligible for WoT Protocol Bindings. If the device itself cannot be modified, a Thing Description may also have to be provided separately using a service such as a Thing Directory or some other external distribution mechanism. Providing a Thing Description for a device also only allows it to be used in the WoT Server role. Using such a device in the WoT Client role may also be possible if the device can be modified to consume Thing Descriptions itself or if a separate management system can be used to configure it using information found in Thing Descriptions. This section discusses how the Web of Things as a whole works when Things implementing IoT devices and services are connected together in various topologies and deployment scenarios. These are only examples and other interconnection topologies are possible. The interconnection topologies described here are derived from the Web of Things use cases () as well as the technical requirements extracted from them (). Before discussing specific topologies, we will first review the roles that WoT Things can play in a network and the relationship of these roles to the Consumed Thing and Exposed Thing abstractions presented internally to each Thing's internal behavior implementation. A WoT Server creates an Exposed Thing abstraction based on a TD. The TD is published to make it available to other WoT Clients or Servients. Such publication can be done in various ways: the TD might be registered with a Thing Directory service, or the WoT Server may provide requesters with the TD upon receiving a discovery request. It is also possible in some application scenarios for TDs to be associated with WoT Servers statically or via a management system. A WoT Client obtains the TDs of WoT Servers via a discovery process appropriate to the deployment scenario in which it is used (Thing Directory, discovery protocol, static assignment, management system, etc.) and creates Consumed Thing abstractions for each based on the obtained TDs. Internal system functions of a device such as attached sensors and actuators can also optionally be represented as Consumed Thing abstractions. The functions supported by the Exposed Thing and Consumed Thing abstractions are provided internally to the Thing's behavior implementation via a programming language interface. In the WoT Scripting API, these abstractions are represented by objects. The behavior implementation (that is, the application logic) running in the Thing can then achieve its functions, such as appropriately responding to interactions, by using this interface. A WoT Server may or may not be a device associated with physical sensors and actuators; it may also be a service running in a gateway or in the cloud. Likewise a WoT Client may or may not be an application service running on a gateway or cloud, it may in some cases be necessary to implement WoT Client functionality on edge devices. In some cases a single Thing simultaneously performs both roles using a single WoT Runtime, in which case we call it a Servient. In the simplest interconnection topology, illustrated by , the WoT Client and WoT Server are on the same network and can communicate directly with each other without any intermediaries. One use case where this topology arises is when the WoT Client is an orchestration service or some other IoT application running on a gateway and the WoT Server is a device interfacing to a sensor or actuator. However, the client/server relationship could easily be reversed; the client could be a device in the WoT Client role accesses a service running as a WoT Server on a gateway or in the cloud. If the WoT Server is in the cloud and the WoT Client is on a local network (for example, in a Smart Home use case) the actual network topology may be more complex, for example requiring NAT traversal and disallowing certain forms of discovery. In such cases one of the more complex topologies discussed later may be more appropriate. A Servient plays both WoT Server and WoT Client roles on the network and supports both the Exposed Thing and Consumed Thing abstractions within its WoT Runtime. One simple application of a Servient is as a proxy. When functioning as a proxy, the Servient generally interfaces with two separate networks or protocols. This may involve the implementation of additional security mechanisms such as providing TLS endpoints. Generally proxies do not modify the set of interactions so the TD exposed by the Servient will have the same interactions as the consumed TD but with the connection metadata modified. To implement this pattern, the proxy Servient obtains a TD of a WoT Server and creates a Consumed Thing. It creates a "shadow" of the WoT Server as a software implementation that has the same interactions. It then creates a TD for the shadow device with a new identifier and possibly with new communications metadata (protocol bindings) and/or new public security configuration metadata. Finally an Exposed Thing is created based on this TD, and the Servient notifies other WoT Clients or Servients of the TD via an appropriate publication mechanism. More complex intermediaries may be known as digital twins. A digital twin may or may not modify the protocols or translate between networks, but they provide additional services, such as state caching, deferred updates, or even predictive simulation of the behavior of the target device. For example, if an IoT device has limited power, it may choose to wake up relatively infrequently, synchronize with a digital twin, and then immediately go to sleep again. In this case the digital twin runs on a less power-constrained device (such as in the cloud or on a gateway) and is able to respond to interactions on the constrained device's behalf. Requests for the current state of properties may also be satisfied by the digital twin using cached state. Requests that arrive when the target IoT device is sleeping may be queued and sent to it when it wakes. One complication with implementing this pattern is that the digital twin Servient needs to know when the device is awake if it is implemented as a WoT Server. The actual implementation may need to be augmented with a notification mechanism (which could be implemented using a separate WoT Client/WoT Server pair), although it may also be possible to use event interactions for this purpose. In Smart Home use cases, devices (sensors and home appliances) connected to a home network are often monitored and, in some cases, also controlled by cloud services. There is usually a NAT between the home network to which the devices are connected and the cloud. The NAT translates IP addresses as well as often providing firewall services, which block connections selectively. The local devices and cloud services can only communicate with each other if the communication can successfully traverse the NAT. A typical structure, adopted in ITU-T Recommendation Y.2070, is shown in . In this structure there is both a local and a remote Servient. The local Servient aggregates the interaction affordances from multiple WoT Servers into a (set of) Exposed Things, which can all be mapped onto a common protocol (for example, HTTP, with all interactions mapped to a single URL namespace with a common base server and using a single port). This provides the remote Servient with a simple way to access all the WoT Servers behind the NAT, assuming the local Servient has used a converged protocol that can traverse the NAT and has some way to expose this service to the Internet (STUN, TURN, DyDNS, etc). In addition, the local Servient can function as a proxy, so even when the connected WoT Servers each use a different protocol (HTTP, MQTT, CoAP, etc.) and/or a different set of ecosystem conventions, the Exposed Thing can converge them into a single protocol so that clients do not need to be aware of the various protocols the servers use. In the figure, there are two clients connected to the remote Servient, which has disaggregated the services available behind the NAT and may provide additional protocol translation or security services. In particular, the local Servient may be on a network with limited capacity and making that service directly available to all users may not be feasible. In this case access to the local Servient is _only_ provided to the remote Servient. The remote Servient then implements a more general access control mechanism and may also perform caching or throttling to protect the client from excess traffic. Those clients also will use a single protocol suitable for the open Internet (e.g. HTTPS) to communicate with the Servient, which makes the development of clients much simpler. In this topology there is a NAT and a firewall between the clients and servers, but the local and remote Servients work together to tunnel all communications through the firewall, so the clients and servers need to know nothing about the firewall. The paired Servients also protect the home devices by providing access control and traffic management. In more difficult cases the NAT and firewall traversal may not work exactly as shown. In particular, an ISP may not support publicly accessible addresses, or STUN/TURN and/or DyDNS may not be supported or available. In this case the Servients may alternative reverse the client/server roles between then to set up an initial connection (with the local Servient first connecting to the remote Servient in the cloud), then the pair of Servients may establish a tunnel (using for example, a Secure Web Socket, which uses TLS to protect the connection). The tunnel can then be used to encode all communications between the Servients using a custom protocol. In this case the initial connection can still be made over HTTPS using standard ports, and from the local Servient to the remote Servient identically to a normal browser/web server interaction. This should be able to traverse most home firewalls, and since the connection is outgoing, network address translation will not cause any problems. However, even though a custom tunneling protocol is needed, the remote Servient can still translate this custom protocol back into standard external protocols. The connected WoT Clients and WoT Servers do not need to know about it. It is also possible to extend this example to use cases where both WoT Servers and WoT Clients can connect on either side of the NAT boundary. This however also requires a bidirectional tunnel to be established between the two Servients. Once local devices (and possibly services) can be monitored or controlled by services on cloud, a variety of additional services can be built on top. For example, a cloud application could change a device's operating condition based on an analysis of collected data. However when the remote Servient is a part of a cloud platform servicing client applications, the clients need to be able to find device information by, for example, accessing a directory of connected devices. For simplicity in the figure below we have assumed all local devices are implemented as WoT Servers and all cloud applications as WoT Clients. To make the metadata of local devices implemented as WoT Servers available to the cloud applications, their metadata can be registered with a Thing Directory service. This metadata is specifically the TDs of the local devices modified to reflect the security configuration and communication metadata provided by the remote Servient. A client application then can obtain the metadata it needs to communicate with local devices to achieve its functionality by querying the Thing Directory. In more complex situations, not shown in the figure, there may also be cloud services that act as WoT Servers. These can also register themselves with the Thing Directory. Since a Thing Directory is a web service, it should be visible to the local devices through the NAT/firewall and its interface can even be provided with its own TD. Local devices acting as WoT Clients can then connect to the Thing Directory either directly or via the local Servient if proxying (e.g. protocol translation) is needed. Multiple cloud eco-systems each based on different IoT platforms can work together to make a larger, system-of-systems eco-system. Building on the previously discussed structure of a cloud application eco-system, the figure below shows two eco-systems connected to each other to make a system-of-systems. Consider the case in which a client in one eco-system (i.e. WoT Client A below) needs to use a server in another eco-system (i.e. WoT Server B below). There is more than one mechanism to achieve this cross eco-systems application-device integration. Below, two mechanisms are explained, each using a figure, to show how this can be achieved. In , two Thing Directories synchronize information, which makes it possible for WoT Client A to obtain the information of WoT Server B through Thing Directory A. As described in previous sections, remote Servient B maintains a shadow implementation of WoT Server B. By obtaining the TD of this shadow device, WoT Client A is able to use WoT Server B through the remote Servient B. In , two remote Servients synchronize device information. When a shadow of WoT Server B is created in remote Servient B, the shadow’s TD is simultaneously synchronized into remote Servient A. Remote Servient A in turn creates its own shadow of WoT Server B, and registers the TD with Thing Directory A. With this mechanism, synchronization between Thing Directories is not necessary. Security is a cross-cutting issue that needs to be taken into account in all WoT building blocks and WoT implementations. This chapter summarizes some general issues and guidelines to help preserve the security and privacy of WoT implementations. For a more detailed and complete analysis of security and privacy threats, risks, mitigations, and best practices, see the WoT Security and Privacy Considerations [[?wot-security]] and the WoT Security Best Practices [[?WOT-SECURITY-BEST-PRACTICES]] documents. Guidelines for the security testing of WoT implementations, including adversarial testing, are given in the WoT Security Testing Plan [[?WOT-SECURITY-TESTING-PLAN]]. Overall, the goal of the WoT is to describe the existing access mechanisms and properties of IoT devices and services, including security. In general, W3C WoT is designed to describe what exists rather than to prescribe what to implement. However, the WoT architecture should enable the use of best practices in security and privacy. The WoT security architecture must support the goals and mechanisms of the IoT protocols and systems it connects to. These systems vary in their security requirements and risk tolerance, so security mechanisms will also vary based on these factors. Security and privacy are especially important in the IoT domain since IoT devices need to operate autonomously and in many cases have access to both personal data and/or can be in control of safety-critical systems. Compared to personal systems, IoT devices are subject to different and in some cases higher risks than IT systems. It is also important to protect IoT systems so that they can not be used to launch attacks on other computer systems. In general, security and privacy cannot be guaranteed. It is not possible for the WoT to turn an insecure system into a secure one. Specifically, the WoT architecture needs to do no harm: it should support security and privacy at least as well as the systems it connects to. means a system should preserve its integrity and functionality even when subject to attack. means information that can be associated with a unique individual. means that the system should maintain the confidentiality of personally identifiable information. The metadata contained in a WoT Thing Description (TD) is potentially sensitive. As a best practice, TDs should be used together with integrity protection mechanisms and access control policies, and should be provided only to authorized users. Please refer to the Security and Privacy Consideration section of the WoT Thing Description specification for additional details and discussion. TDs are designed to carry only public security data. Producers of TDs must ensure that no private security information is included in TDs. There should be a strict separation of public and private security data. A TD should contain only public security information, letting users know what they need to do to access as system if and only if they have authorization. Authorization in turn should be based on separately managed private information. The built-in TD security schemes defined in the TD specification do not support the encoding of private security data. However, other fields such as human-readable descriptions might be used (incorrectly...) to encode this information, or new security schemes might be defined and deployed via the extension mechanism that encode such information. TD producers must ensure that no private security data is ever stored in TDs. Thing descriptions can potentially contain personally identifiable information of various types. Even if it is not explicit, the presence of semantic information in a TD and its association with a person can be used to infer information about that person. For example, the association of uniquely identifiable TDs exposed by mobile devices whose location can be determined can be a tracking risk. Generally, personally identifiable information in a TD should be limited as much as possible. In some cases, however, it cannot be avoided. The potential presence of PII in a TD means that TD should be treated like other forms of PII. They should be stored and transmitted in a secure fashion, should only be cached for limited times, should be deleted upon request, should only be used for the purpose for which they were provided with user consent, and they should otherwise satisfy local requirements for the use of PII. Storage of PII in TDs should be minimized as much as possible. Even without explicit PII in TDs, a tracking and identification privacy risk may exist. To minimize this risk, TDs should be treated as if they contained PII and subject to the same management policies as other PII. They should only be provided to authorized users. The WoT Binding Templates must correctly support the security mechanisms employed by the underlying IoT Platform for that platform to be considered eligible for use with WoT. Due to the automation of network interactions necessary to deploy IoT at scale, operators need to ensure that Things are exposed and consumed in a way that is compliant with their security policies. Whenever possible, use the vetted communication metadata provided in the WoT Binding Templates. When using a TD for an IoT ecosystem not covered by the WoT Binding Templates, ensure that all the security requirements of the IoT Platform are satisfied. The WoT Runtime implementation and the WoT Scripting API should have mechanisms to prevent malicious access to the system and isolate scripts in multi-tenant Servients . More specifically the WoT Runtime implementation when used with the WoT Scripting API should take into account the below security and privacy risks and implement the recommended mitigations. In basic WoT setups, all scripts running inside the WoT Runtime are considered trusted, distributed by the manufacturer, and therefore there is no strong need to perform strict isolation between each running script instance. However, depending on device capabilities, deployment use case scenarios, and risk level it might be desirable to do so. For example, if one script handles sensitive privacy-related PII data and is well-audited, it might be desirable to separate it from the rest of the script instances to minimize the risk of data exposure in case some other script inside WoT gets compromised during runtime. Another example is mutual co-existence of different tenants on a single WoT device. In this case each WoT runtime instance will be hosting a different tenant, and isolation between them is required. The WoT runtime should perform isolation of script instances and their data in cases when scripts handle privacy-related or other critical security data. Similarly, the WoT Runtime implementation should perform isolation of WoT Runtime instances and their data if a WoT device has more than one tenant. Such isolation can be performed within the WoT Runtime using platform security mechanisms available on the device. For more information see Sections "WoT Servient Single-Tenant" and "WoT Servient Multi-Tenant" of [[wot-security]]. In case a script is compromised or misbehaving, the underlying physical device (and potentially surrounded environment) can be damaged if a script can use directly exposed native device interfaces. If such interfaces lack safety checks on their inputs, they might bring the underlying physical device (or environment) to an unsafe state. The WoT Runtime should avoid directly exposing the native device interfaces to the script developers. Instead a WoT Runtime implementation should provide a hardware abstraction layer for accessing the native device interfaces. Such hardware abstraction layer should refuse to execute commands that might put the device (or environment) to an unsafe state. Additionally, in order to reduce the damage to a physical WoT device in cases a script gets compromised, it is important to minimize the number of interfaces that are exposed or accessible to a particular script based on its functionality. If the WoT Runtime implementation supports post-manufacturing provisioning or updates of itself, WoT scripts, or any related data (including security credentials), it can be a major attack vector. An attacker can try to modify any above described element during the update or provisioning process or simply provision attacker's code and data directly. Post-manufacturing provisioning or update of scripts, the WoT Runtime itself or any related data should be done in a secure fashion. A set of recommendations for secure update and post-manufacturing provisioning can be found in [[wot-security]]. Typically the WoT Runtime needs to store the security credentials that are provisioned to a WoT device to operate in WoT network. If an attacker can compromise the confidentiality or integrity of these credentials, then it can obtain access to the WoT assets, impersonate WoT things or devices or create Denial-Of-Service (DoS) attacks. The WoT Runtime should securely store any provisioned security credentials, guaranteeing their integrity and confidentiality. In case there are more than one tenant on a single WoT-enabled device, a WoT Runtime implementation should guarantee isolation of each tenant's provisioned security credentials. Additionally, in order to minimize a risk that provisioned security credentials get compromised, the WoT Runtime implementation should not expose any API for scripts to query the provisioned security credentials. Such credentials (or event better, abstract operations that use them but do not expose them) should only be accessible to the Protocol Binding implementation that uses them. Special thanks to all active Participants of the W3C Web of Things Interest Group and Working Group for their technical input and suggestions that led to improvements to this document. Sept 2017: First Public Working Draft. March 2019: Public Working Draft for TAG review.